Once upon a time, population was a central issue in the international debate on the future of the planet. 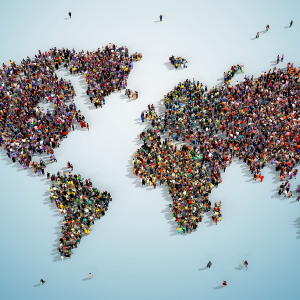 Despite profound ideological and political differences among the major players of the global scene, there was consensus that population growth and change were major factors affecting social and economic development. This common awareness reached a climax between the early 1970s and early 1990s, marked by three UN-sponsored Conferences in Bucharest (1974), Mexico (1984) and Cairo (1994).The latter Conference (ICPD, or International Conference on Population and Development) approved a major declaration (Programme of Action) containing a summa of all desirable actions to be initiated, implemented or sustained, concerning all facets of population dynamics, in the full respect of human rights, and oriented to achieve sustainable development1. The document summoned states, national and international organizations, private and public institutions, and NGOs, to provide adequate support and resources in order to reach the general goals of the Programme. Population had a more limited role in the Millennium Development Goals (MDG), issued after the Millennium Declaration of the year 2000. Three of the eight goals (4, 5 and 6) concerned child mortality, maternal health (and, indirectly, fertility), and the major scourges like HIV/AIDS or malaria, but population growth as a challenge to development was not at the forefront. Now that 2015 is approaching fast, with mixed results as far as the attainment of the MDGs is concerned, the international community is struggling to find new keywords and messages around which the concerns, resources and actions can be mobilized. A post-2015 development agenda must be designed and approved. Various influential documents2, crafted by international groups, have been prepared, with different perspectives and approaches. For all of them, however, a central keyword is “sustainable development”, that must inform all actions at the local, national or planetary level. From one of these documents: “MDGs fell short by not integrating the economic, social, and environmental aspects of sustainable development as envisaged in the Millennium Declaration, and by not addressing the need to promote sustainable patterns of consumption and production. The result was that environment and development were never properly brought together.”3 Another document points out that “the scale of human impact on the physical Earth has reached dangerous levels more rapidly and disruptively than was foreseen by most in 2000”4. However, these and other official documents are not explicit about the role that population growth – an extra three and a half billion inhabitants before the end of the century – will have on sustainable development. Indeed, rapid population growth may be “unsustainable” if it continues unabated. This example shows how, in poor societies, the impact of population and economic growth on the environment is going to be very heavy, unsustainable, one would be tempted to say, in the coming decades. Hence two general priorities; the first being an acceleration of technological transfers from the rich to the poor world and the second priority will consist of reducing the speed of population growth. If fertility remained unchanged (at the current TFR level of 5.4) over the next 36 years, the population of Sub-Saharan Africa would triple between 2014 and 2050 (from 0.9 to 2.8 billion). If TFR declined to 2.7 by 2050 (as assumed by the low variant of the UN projections) population would “only” double (from 0.9 to 1.8 billion). It is a brutal calculation, but a one point difference of TFR in 2050 corresponds approximately to 350 million people difference in the population at the same date. Sustaining the fertility decline, as I have argued at the beginning, must remain a priority central to the sustainable development discourse. On the other hand, improving the human capital of the population (including the enhancement of its demographic component) will set the ground for responding to the second priority, the acceleration of technological transfers. 3 – New Global Partnership, cit. “executive summary”.